If you were planning to pickup a Nexus 4, either 8 or 16GB, chances are you're out of luck. According to various social media (reddit, Twitter) the Play store started selling the Nexus 4 at 11:45-11:50AM ahead of the rumored 12PM launch. 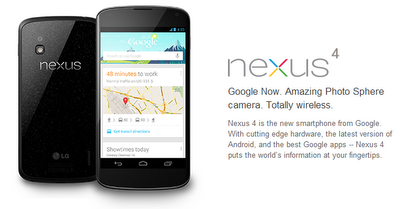 We were planning to grab a Nexus 4 of our own to review to no avail. Fortunately, those planning to get the Nexus 7 32GB /w HSPA+ or Nexus 10 16GB/32GB should still be in luck as the seem to still be available as of this post. But considering the speed with which the Nexus 4 sold out, we wouldn't wait too long.